Pre-heat your oven to 180 degrees celsius / 350 F / Gas Mark 4. Place your fish in a dish greased lightly with olive oil. Add the milk. 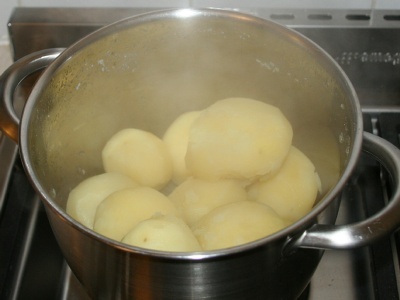 Peel your potatoes, put them in a saucepan and cover with water. Add a pinch of salt and bring to a boil. When the potatoes are boiling, put the fish into the oven. After 20 minutes, take the fish out and take the potatoes off the hob. Now turn up the heat of the oven to 220 celsius / 425 F / Gas Mark 7. 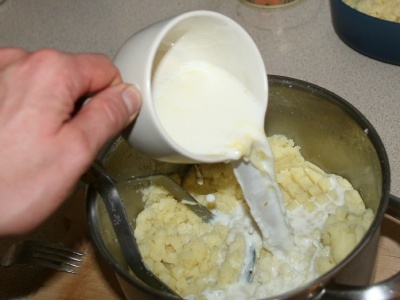 Pour the water off the potatoes and mash with butter, salt, pepper and the milk you used for the fish. Grate the cheese. 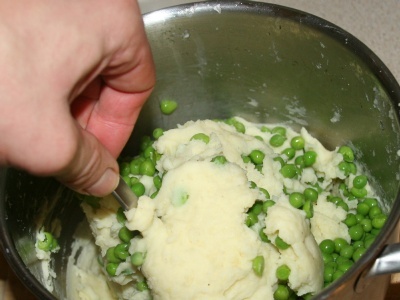 Mix the frozen peas and the mash with a fork - do not use too much force to keep the peas intact. 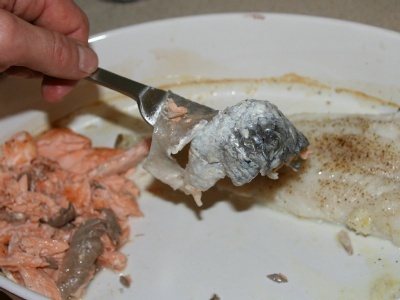 Separate the fish into small chunks take off the skin. 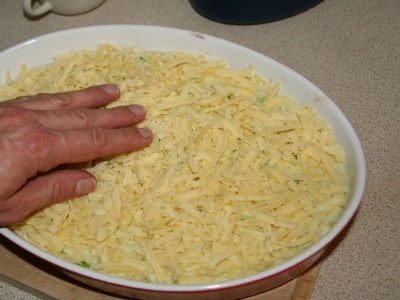 Spread the mash over the fish and put the grated cheese on top. Put your dish in the oven and leave it there for 20 minutes. If your oven doesn't heat up evenly, turn the dish after 10 minutes. Take out and serve! Enjoy with a dry white wine - like a French "Entre deux mers"
Preheat the oven to 180 degrees celsius / 350 Fahrenheit / Gas Mark 4. Use an ovenproof dish. 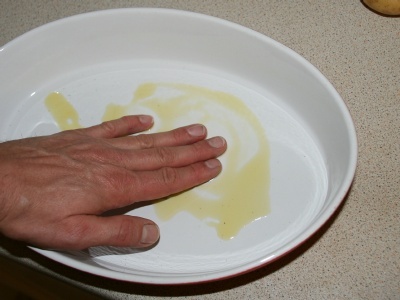 Pour a small amount of olive oil into the dish and distribute evenly with your fingers. This will keep the fish from sticking to the dish. 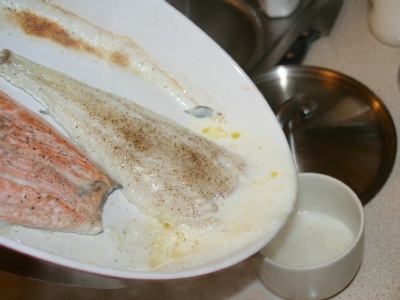 Place the fish pieces with the skin side down into the dish, salt and pepper lightly and pour the milk over the fish so it's about half covered. 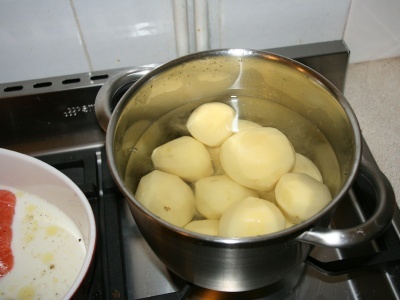 Peel the potatoes, put them in a saucepan and cover them with water. Add a pinch of salt to the water and bring to a boil. When the potatoes are boiling, put the fish into the oven. 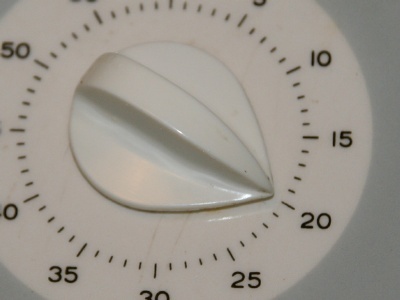 Set your kitchen timer to 20 minutes, relax and have a glass of wine. 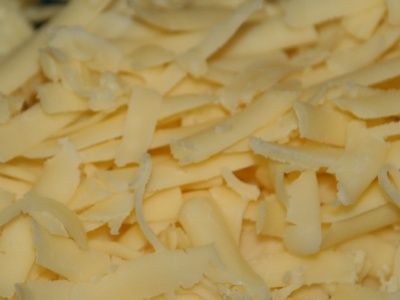 Grate the cheese - this doesn't have to be too fine. The chunky cheese grater will do. When the 20 minutes are up, drain the potatoes and let them sit in the saucepan without a lid - we want the rest of the water to evaporate. Remove any bits of milk skin from the dish. 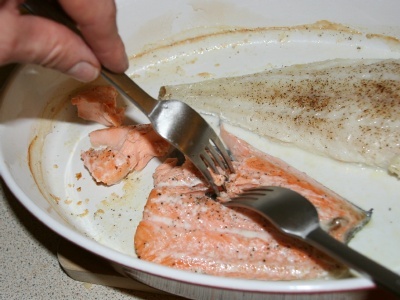 Using two forks, separate the fish into small bits pulling them off the skin. 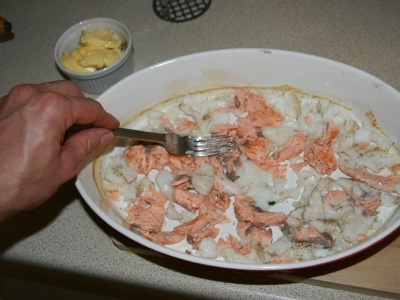 Then remove the skin from the dish. It will come off easily as we greased the dish earlier. 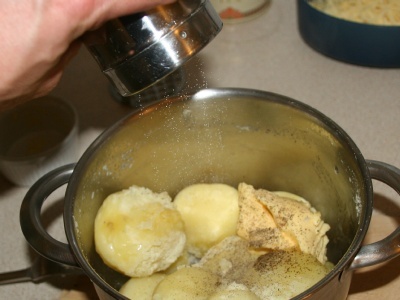 Put the butter, some salt and pepper to the potatoes. 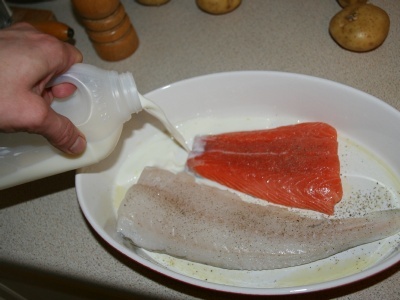 Add 3/4 of the milk you drained off the fish earlier to the mash. 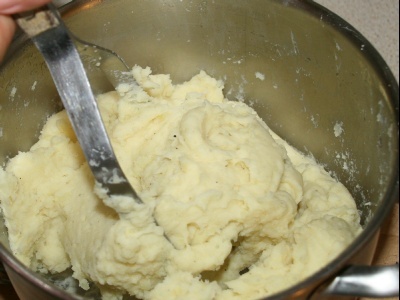 Now mash the potatoes until they are smooth and creamy and not crumbly. If it is too thick, add more of the milk. You want a nice, smooth, slighly moist consistency. 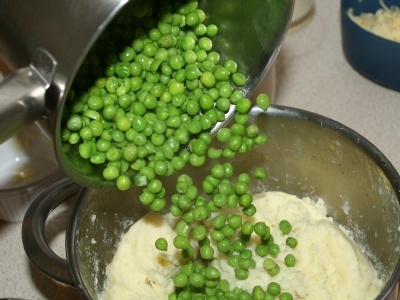 ... and very gently mix them into the mash using a fork. Be careful not to damage the peas. ... and distribute it evenly. Now we can put the dish back into the oven. Leave it there for 20 minutes. After 10 minutes, turn it 180 degrees so the cheese can brown evenly - most ovens don't distribute the heat evenly - not even fan assisted ovens. 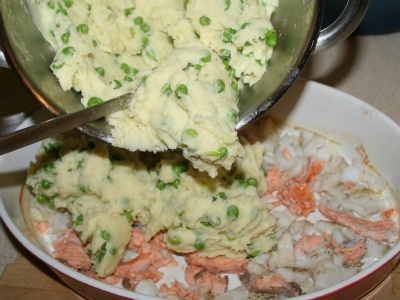 This is what your fish pie should look like - enjoy! 10 Brilliant, Brilliant !!! Thanks Photos are great help ! Thank you. 9 very easy to follow. my husband is going to be very pleased. so easy and fast for dinner tonight. The best recipee. 10 Wonderful,Brilliant,Tasty, and easy to make. Love it!!! 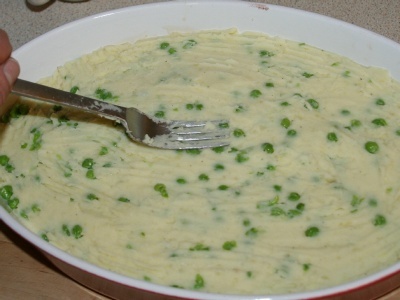 10 my 1st fish pie looks just like yours mmm hope it tastes good. Instead of milk I used coconut cream and cream, 1 potato and 1 Sweet Potato. 1 Tin of Tuna in oil and 1 tin of Tuna in spring water. 10 This is how all recipes should be presented online. Wonderful. .
10 10 nice to do it your way! 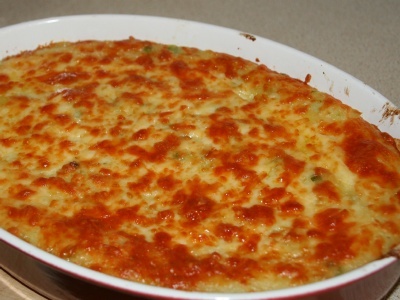 10 I used a mix of pollock, smoked haddock and prawns to great effect, probably more like 500g fish and used 250g cheese as we love it cheesy. 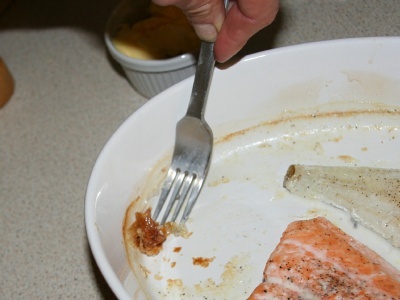 Great recipe that can be adapted to whatever fish is the best value - will try salmon next time. Friends were very complimentary. Thanks!! 10 easy to make and delicious. 10 Great, thanks for this. Will be my first pie. Its in the oven as I type this and looks good. Instead of peas I cut up Green beans and carrots into small pieces. Thank you again. 10 Love the visual prompts. As a really inexperienced cook, I think recipe is fab! Thank you :) esp love the fact your telling me to sit down & drink wine!!! 10 Great dish I have cooked before. A long time ago. Thought I knew the routine and just followed WRITTEN instructions and found the mash too runny. Then I looked at the step by step instructions, lo and behold it says 3/4 of the milk.Please amend the WRITTEN instructions. I am waiting for the dish to cook right now, hope it is not ruined.!!!!!! 10 Thankyou - am making it right now! 10 So easy and yummy, thanks! 10 Very easy to follow. Can't wait! 10 Can't wait! Sounds delicious. 8 going to make it for supper tonight, have never cooked fish pie before. looks simple to do which appeals to me no tricky sauces to make. 10 Looks really good I am going to make the fish pie on Monday. Thanks. 10 Going to make this today! 10 Thank you... Will be using it! 2 You can call me and I will mail you one or you can download it off our sound cloud on our Tasty Sounds foeabock page. And yes it is a cure for peace. I drove around recently in some tough neighborhoods and and cranked this mix and everybody that heard it hugged the person next to them. 9 Great. Found the pictures very useful. 10 I've made this many times using your recipe, with salmon or cod. Delicious and fool-proof every time! 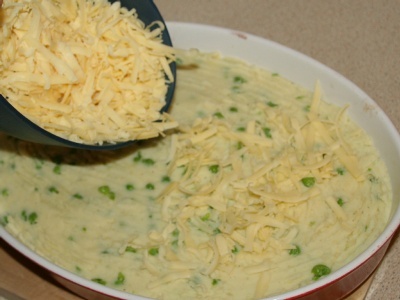 10 the easiest way to make a fish pie. Great without the flour.